Getting lost in a story is a dangerous temptation. Adam is a comic book writer coasting on his past successes in the glossy pages of Mynx and Savage. Much to his chagrin, his employer has assigned him a partner, Ket, to ensure he makes his next deadline. Ket is young and ambitious; her life was changed by Adam’s first serious graphic novel, and she aches to know what new, “important” work Adam is working on. 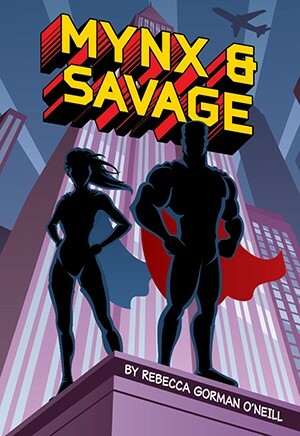 As the duo sets to work on the 100th issue of Mynx and Savage, the fantasy bleeds into reality as the superheroes and their mild-mannered alter egos invade the artists’ space. Adam finally starts to trust Ket and shares the story he’s been hiding. It is the story of Jill and Kyle, two childhood friends on summer break who dream of superheroes. Where Kyle is frightened, Jill is brave; where Kyle is secretive, Jill insists on honesty. This is the story that tortures Adam, the story he’s been hiding from the world; it’s the origin story of Mynx and Savage. In the end, as the worlds of the children, the superheroes and the artists collide, Ket helps Adam realize that he has no future until he makes amends with his past.